Orange accidentally offered the N97 Mini for purchase in the UK, prompting Nokia to issue a statement that it will be the first to launch the new device. "We can confirm that there hasbeen a technical error with our information feed that has supplied third party websites with availability and pricing for the Nokia N97 Mini," a spokesperson told TechRadar. "We are working to resolve this issue. Orange can confirm it will be ranging the Nokia N97 Mini and correct pricing and availability will be available in due course." 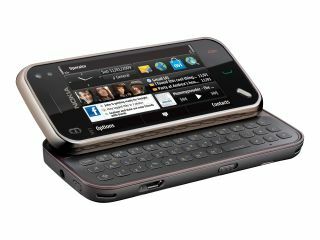 "The Nokia N97 mini will begin shipping in October, however an exact UK release date has not yet been announced. We can confirm that the device will go on sale in Nokia's flagship stores before it is sold through any operators," said Nokia in a statement to TechRadar. Customers could see the device available to order on third-party deal aggregation sites, which will then take them through to the official Orange page for purchase. However, the Nokia N97 Mini is not available to search for from Orange's site, which means it's a mystery why the network is offering it through third party channels, and now looks likely to be taken down, although it hasn't at the time of writing. It seems when the Nokia N97 Mini does land on Orange, users will have to pay at least £97.50 to get the phone as well, despite signing up to a £63.61 a month deal for two years. It all seems a bit suspicious at the moment, given the super-high cost of the phone which is available for pre-order from the Nokia website for £429, so we'll wait with bated breath for the actual release date.